Lahanoryzo also written lahanorizo, pronounced lah-ha-NOH-reeh-zoh, is a traditional Greek vegan dish made with cabbage and rice. This dish is similar to Spanakoryzo (spinach and rice) and therefore it can also be made without the tomato by adding some lemon juice. Although I cook spanakoryzo very often, this is a dish I rarely cook, as my children hate the smell of cabbage. However, we miss it every now and then and cook it when my huband and I are alone at home. After cooking it, I open the doors and windows wide open so that the house does not smell!! Think of this dish as Lahanodolmades (cabbage rolls) but much more easier and without the minced meat. Here you do not need to blanch the cabbage but just shred or grate it and you don’t make an avgolemono sauce at the end. To make the traditional lahanoryzo, you shred, grate or finely chop the cabbage. Olive oil is added to a skillet or pot and you sauté the onion until translucent. You then add the garlic and sauté it for a few seconds, to release its aroma and then add the cabbage, the carrots, wine, tomato, spices and vegetable stock and cook until the cabbage is soft. Finally you add the rice and cook it in the sauce. I made this recipe with leftover cabbage just a few days after making “Lahanodolmades”(stuffed cabbage with minced meat and rice. 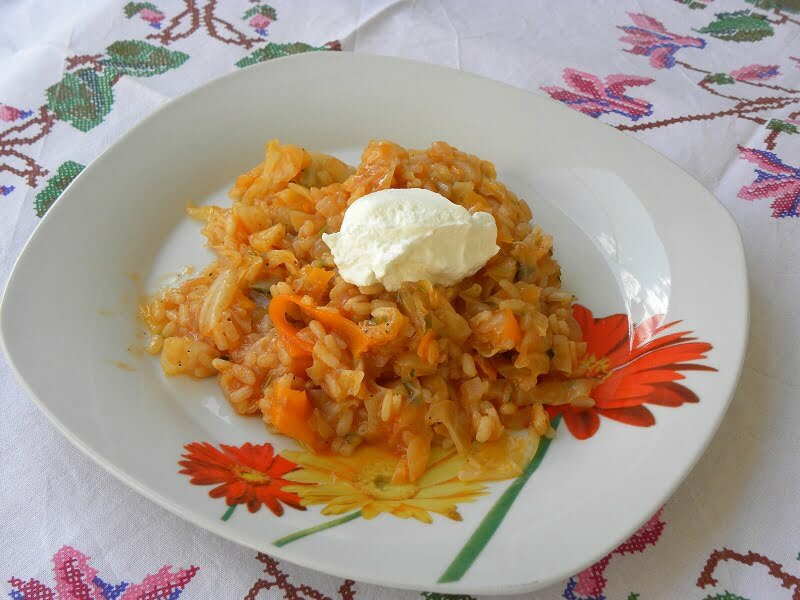 The traditional recipe for “Lahanoryzo” is with cabbage and rice and tomato but this version is my twist, making it with less tomato and adding carrots, wine and cumin which made it delicious. This vegan dish is very cheap considering you will require only a few, cheap ingredients and you can serve it as a main dish, with some Greek yoghurt or feta or as a side dish to meat. Lahanoryzo is a frugal, vegan dish, made with cabbage and rice, cooked in a light tomato sauce..
Heat olive oil in a large pot and sauté onion until translucent. Add garlic and sauté for 1 – 2 seconds until fragrant. Add the cabbage and carrots, salt, pepper and cumin and cook until wilted. Add the wine and cook for a few minutes until the alcohol evaporates and add the tomato, tomato paste and vegetable stock. Bring to a boil and lower heat. Cook for about 20 minutes until the cabbage is soft. Add rice and cook for 15 more minutes. Mix in parsley and lemon juice and remove from the heat. Let it sit for ten minutes for the flavours to develop. Serve with some feta or Greek yoghurt. Thanks Lore, hope you will enjoy it. Don’t rush for the event as we still have plenty of time.